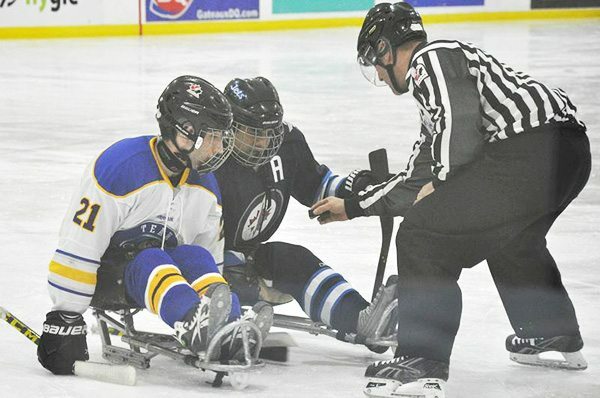 Kindersley’s Braden Close takes a faceoff for Team Alberta during the recent national sledge hockey champi-onships recently held in Montreal. Close and his team-mates won the championship for the second straight year. Braden Close won his second title with Team Alberta at the Canadian Sledge Hockey Championship in Montréal on May 14 – and he remembers it this time. A year ago, the now-21-year-old centre hit an opponent head-on with three seconds left in a 3-1 gold-medal win over Ontario and suffered a concussion. Close had two goals and two assists as Alberta went undefeated through the 2017 tournament in Montréal. And he was on the bench for the final seconds this year when they shut out Québec 3-0 in the final. See more on this story in the May 24 print edition of The Clarion.